JUPITER, Fla. — It was so long ago that I’ve forgotten exactly how it came up, but it happened not to far from here — down Interstate 95 and just south of West Palm Beach, Fla. I grabbed a fistful of white paper from the Xerox machine nearest by desk at The Palm Bach Post. I raided an art supply store for some sketching pencils, a trusty pica pole, an industrial-strength eraser, a Uni-Ball pen, and fine-point detailing pens. I set up a rather low-frills drawing studio at a glass coffee table. And I started drawing. It might have been the small self portrait I included on my resume, or the line about drawing a twice-weekly cartoon at The Maneater. Regardless, the sports editors at the PB-Post had a challenge and an offer for their eager intern. There was a spot in the Sunday paper for a cartoon, if I wanted to draw them. I don’t remember how many I did that summer, back in 1996. I was most proud of one that captured John Boles big-eyed stare just right as he inspected his new troops, the cleaned-and-pressed Florida Marlins. Another featured Jimmy Johnson scuba diving for a Lombardi trophy with a friendly dolphin furiously trying to save him from the depths of glory. Somewhere in my files these originals exist. I’m more thrilled by the actual copies of the paper because, heck, it meant I was a published cartoonist in a metro daily. I doubt I could have made a career of scribbling and it’s too often you get a seat in the baseball press box as a cartoonist anymore, so writing seemed like the better way to go. I promised that when I had a kid however, I’d unpack the pens, borrow (ahem) some paper from the nearest Xerox machine and doodle again. Awhile back a friend asked me to try cartooning again for him. I wrote a month or so ago about the challenge of getting Mike Schmidt’s mustache right as I worked on this cartoon for his new St. Louis baseball historical journal. I promised then to reprint the one-panel cartoon here when the journal went to press. The journal has had a delay, but my friend said it would be OK to pop the cartoon up here and spread it around the various webby places my print work appears. It’s fitting then that the first sports cartoon I’ve drawn since appearing in the pages of The Palm Beach Post appears while I’m in the Post’s backyard. Go ahead, try and name all of the players featured, including the ones in the memorial pictures on the wall. We’ll see if they ask me to draw another one. This entry was posted in baseball, cartoons, journal, journalism, project 365+ by dgoold. Bookmark the permalink. Thats Hilarious and awesome with stark truth reality! Joe Dimaggio, Walter Johnson, Bob Feller, Mickey Mantle, Kirby Puckett, Robin Yount, Ernie Banks, Stan Musial, Whitey Ford, Bob Gibson, Mike Schmidt, Sandy Koufax, George Brett, Cal Ripken, Jr., Tony Gwynn, Johnny Bench. Joe Dimaggio, Walter Johnson, Bob Feller, Mickey Mantle, Ted Williams, Kirby Puckett, Robin Yount, Ernie Banks, Stan Musial, Whitey Ford, Bob Gibson, Mike Schmidt, Sandy Koufax, George Brett, Cal Ripken Jr., Tony Gwynn, Johnny Bench. I love how Gibson has that ticked-off look on his face. If that’s supposed to be Ernie Banks, you’ve got him in the wrong uniform. The one pictured is a White Sox jersey. Is it sad that for some reason I thought Whitey Ford was Derek Jeter? I love it, Derrick! Thanks especially for getting Kirby on the wall. Despite years of not drawing regularly, your art skills have only improved, not diminished, since the Maneater days. That’s Jeter, not Whitey Ford. Right? Fabulous work, Mr. Goold. Very nice. That IS Jet-ah, isn’t it? Great job Mr. Goold. You definitely have talent and remind me I need to pick up my pencils again once I’m done with grad school in July. Great work. I love this kind of stuff. Where’s Yaz? Clemente? Brooks? Gehrig? Just curious how you chose the players. I could have stuffed about 30 players around the table and on the wall, but I had to choose to make the point. Players with distinctive looks from the modern era fit best. Ripken edged Broosk, for example. Clemente was a tough cut. He was on the wall, but it was too cluttered and the text had to go somewhere in the box — not, say, at the bottom as a caption. It only worked if it was tied to Musial. Gehrig drew the short straw because there were already too many Yankees. Nice work! I especially like how you were able to show Joe D’s distinctive swing from not much more than a stick figure. Alas, I too thought Jeter was Ford. Why would Jeter be at the table? He’s not retired yet. They should be saving a seat for him like they were for Pujols. See, if they were all retired then the question would be — why a seat for Pujols? He’s not retired. The table had to include a player who is signed through (likely) the end of his career, thus offering a contrast with Pujols who did not sign the contract. 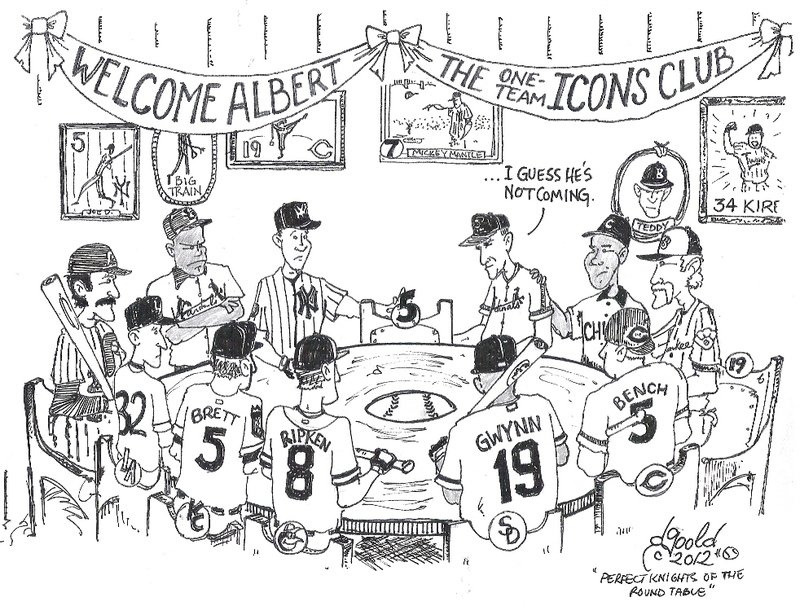 There had to be a current, active and single-team player at the table to make the point or else the cartoon dates itself. Hm. Okay, just as long as you promise to draw a cartoon of them kicking Jeter out when he’s playing for the Portland KillerKatz in 2019. I got to this from a link from msnbc sports and I have to say that I love it. I love keeping the table to 12 and I love going to the wall when you die. As I said on their board, I picture a few at the window, wondering when someone is going to “move to the wall” so they can get in. Nice touch…though Red Sox fans would likely want Ted Williams or Carl Yastrzemski to offset the three Yankees.